Learn what makes the nanoscale special and how it’s led to improvements in everyday products. 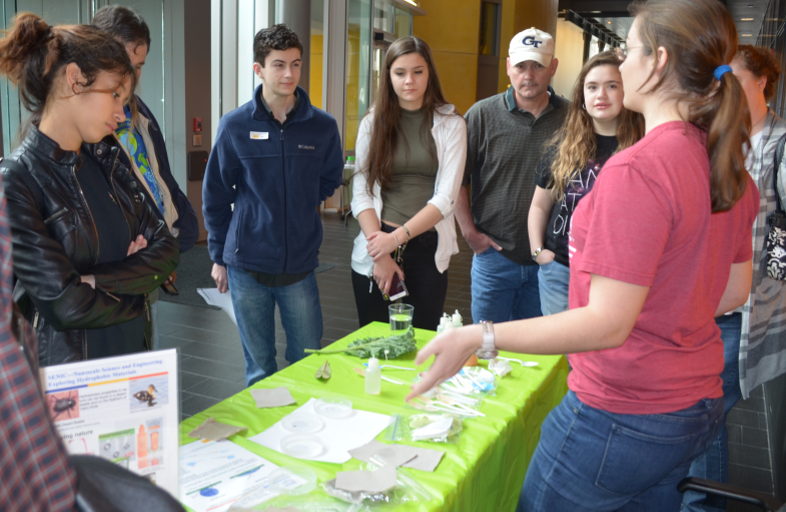 Join Georgia Tech scientists and engineers in hands-on activities exploring the nanoscale. What is nano about a lotus leaf and how do we use this effect? How can clear nail polish be colorful? What is a smart material? What do objects look like under a scanning electron microscope (SEM)? Bring a sample to scan (not wet, and less than an inch in diameter, please) with our tabletop SEM. Getting there: Marcus Nanotech is a 15-minute walk from either the Midtown or North Ave MARTA Station. Walk to Tech Square, then go west on Fifth Street/Ferst Drive. The Georgia Tech Trolley is free and runs every 35 minutes from 10 AM to 6:40 PM from campus to Midtown MARTA. If you drive, parking is available in Visitors Area 4 (State Street and Ferst Drive) and 5 (North Campus Parking Deck) on the Georgia Tech campus. See more info here.